Author of the popular cook-book Uncommon Taste. This Orc is known to the world as "The Gourmet", one of the great chefs of the Fourth Era. He was last seen traveling through Skyrim in 4E 201. Balgruuf the Greater was the Jarl of Whiterun, and a direct descendant of King Olaf One-Eye. An admirer of the Greybeards, Balgruuf made the pilgrimage to High Hrothgar in his youth. He carried on a rivalry with Ulfric Stormcloak since they both were young. He had multiple children, including Frothar, Dagny, and the youngest Nelkir. While considered to be an honorable warrior who put his heart and soul into his service, he was also not considered a patient man. Following the White-Gold Concordat, which Balgruuf had no influence in negotiating, he was purportedly given chests of gold and told to accept the terms. However, he continued worshipping Talos privately, and according to Nelkir, hated the Thalmor as passionately as the Stormcloaks. For more information, see the lore article. Baloth Bloodtusk was an Orc hero and leader of the Savage Sons. Baloth played a crucial role during the Siege of Orsinium in 1E 950. Initially, he did not wish to take part in the war or join King Golkarr. During the siege, King Joile of Daggerfall sent him a letter in which proposed he join him instead. Although King Joile was allied with Gaiden Shinji, he had already planned to betray him and invade Hammerfell after having destroyed Orsinium. He and his Reachman general, Mercedene, manipulated Baloth Bloodtusk and Shinji into having a duel over Orsinium's fate. During the duel, Mercedene ordered Joile's archers to kill both combatants, effectively removing the most powerful warriors of both Orsinium and the Order of Diagna for Joile. After their death, both warriors were buried in Honor's Rest in Wrothgar. Barbas is the Hound of Clavicus Vile. He is a shapeshifting Daedra, although he most commonly takes on the form of a dog or Skaafin. Barbas acts as a repository for around half of Vile's power, though behaves as his loyal servant rather than equal, often pining for his approval to little avail. According to Vile, he likes being a dog—as well as many other things—on sunny days. "When he's like this, I think he's somewhere else. It's all quite significant, of course... But who knows what it means." Although Vile is always depicted along with Barbas, the Prince often grows tired of him and abandons him. While Barbas seems to be subservient to Clavicus Vile, he also often warns people against Vile's plots, suggesting he has some discretion and free will. He sometimes takes the form of a musically talented scamp merchant named Creeper. Queen Barenziah is one of the most famous figures of the Third Era. She became the first Queen of Morrowind, a vassal ruler to the Emperor of Tamriel. 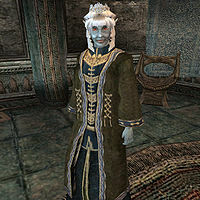 Her consort was Symmachus, former general of Emperor Tiber Septim (and the Emperor himself was rumored to be one of Barenziah's former lovers). Though her position was largely ceremonial for most of the Third Era, the couple were said to be popular with the people of Morrowind. The Queen was considered a loyal vassal throughout the era, and sided against Uriel Septim III and Queen Potema during the War of the Red Diamond circa 3E 120. However, circa 3E 391, she went into exile due to unrest in her province. Symmachus was killed in a riot, and she was forced to abdicate her throne to her uncle Athyn Llethan. Of all her adventures, she is most well-known for going on to help thwart the impostor Jagar Tharn and bring about an end to the Imperial Simulacrum by 3E 399. She married King Eadwyre of Wayrest, who she had forged a bond with while working to defeat Tharn and free the captive Emperor Uriel Septim VII. In 3E 417, she and Eadwyre were among the political leaders of the Iliac Bay who sought to acquire the Totem of Tiber Septim from an agent of the Blades, and who benefited greatly from the ensuing Miracle of Peace, or "Warp in the West". Barenziah claimed ignorance on what exactly transpired during this mysterious two-day phenomenon. Several years later, when Eadwyre died, she returned to Morrowind, where her son Prince Helseth soon became King, while she took on the title of Queen Mother. Her other child, Princess Morgiah, had already gone on to become Queen of Firsthold. She may have had other children, one of many disputed facets of her life. For more information, see the lore article. Barilzar was a powerful Dark Elf mage who lived in Morrowind in the Second Era. He created the infamous artifact, Barilzar's Mazed Band. The son of the Empress Alessia and her consort, Morihaus, and one of the first minotaurs. Belharza succeeded his mother as ruler of the Alessian Empire upon her death in 1E 266. Little is known about the emperor's life and reign as most records of the period were destroyed following the rise of the Alessian Order. Private correspondence between Belharza and Alessia is held in the Library of Dusk in Coldharbour, though its contents are unspecified. A surviving document from an Alessian Order sect indirectly implies that Belharza was troubled by large Ayleid hordes. One controversial interpretation of an ancient tablet fragment called the Belharza Stone asserts that the precursors of the xenophobic Order may have openly clashed with Belharza, and violently purged the minotaurs from the Empire. The Colovian King of Anvil who led the All Flags Navy against the Sload of Thras shortly after the Thrassian Plague of 1E 2200. Syrabane is said to have aided him in this victory, which is marked as the time when Colovia began to overshadow eastern Cyrodiil, leading to the War of Righteousness. His notes became a rare source of information on the Sload, and were disseminated by scholars for many years. Archmaster of House Redoran who resided in Ald'ruhn during the years prior to the destruction of Dagoth Ur. He was renowned as a strong, ruthless leader, credited for securing Redoran holdings during the opening of Vvardenfell, and for moving the Council to Ald'ruhn. He was killed in a duel after refusing to name an outlander as Hortator. Borgas of Winterhold was a Nordic High King and the last in the line of the Ysgramor dynasty. He is also believed to have been the last monarch to wear the legendary Jagged Crown. During his reign, he outlawed the traditional Nordic pantheon of deities in favor of doctrine based on the Alessian Order in Skyrim. This act would become known as the "shadow of King Borgas" and lasted for over a hundred years until it was violently reversed by High King Wulfharth. He was also one of Marukh's chief supporters, however as the prophet's teaching began to spread, hostility grew between the Camoran Dynasty of Valenwood and the Empire. Borgas traveled to Cyrodiil to urge a joint war against the Bosmer, but fell victim to Valenwood's infamous Wild Hunt in 1E 369. Eric of Guis wrote that he was killed for the "iniquities" of his Alessian faith. His body was secretly returned to Skyrim and buried with the Jagged Crown in the Nordic tomb of Korvanjund. Also known as Brand-Shei. The sole heir to House Telvanni. He was raised by Argonians and his identity kept from him. In 4E 201, he discovered his true identity with the help of the Last Dragonborn. A little-known member of the Reman Dynasty who succeeded Reman II and preceded Reman III. He reportedly had a habit of personally leading combat from the vanguard of his forces. Disinterested in matters of state, Brazollus Dor spent most of his reign at his country estate near Skingrad, preferring to let his Potentate Sidri-Ashak run almost all of the Empire's affairs. This has been noted as Dor's only wise decision, for Sidri-Ashak proved to be a particularly adept administrator. A noble in the courts of Kings Lysandus and Gothryd of Daggerfall in the Third Era, Lord Bridwell was also head of the Knights of the Dragon, and protector of the city and royal family of Daggerfall. Lord Bridwell served as general of Daggerfall's army during the War of Betony, and was instrumental in Daggerfall's victory at the Battle of the Bluffs. Some sources claim it was Lord Bridwell who struck down King Camaron of Sentinel at the Battle of Cryngaine Field, which ended the war. It is also rumored that before the war (and possibly after), he was secretly having an affair with Queen Mynisera. 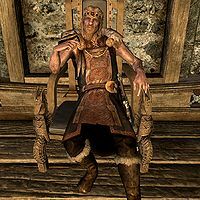 Duke-Prince Indoril Brindisi Dorom was ruler of Mournhold and was killed during the destruction of the city by Mehrunes Dagon on 12 Sun's Dusk, 1E 2920. The destruction of the city was an act of revenge by his former mistress, Turala. The Duke banished her upon discovering that she was pregnant with his child, and she wandered across Tamriel until ending up in Phrygias, High Rock where she joined the Skeffington Coven of witches. When the coven was destroyed, she was tricked into believing that the Duke was responsible and invoked Dagon to take revenge. The Duke is commemorated by the plaza that bears his name in the rebuilt city of Mournhold. Lady Brisienna Magnessen (formally styled Brisienna, Lady Magnessen, informally Lady Brisienna or Lady Magnessen) was a noblewoman and also a highly skilled agent of the Blades during the reign of Emperor Uriel Septim VII. She was the sister of the Great Knight, the leader of the Blades at that time. Lady Brisienna was once in the employ of Queen Mynisera of Daggerfall, though she was secretly the Emperor's agent in the kingdom's court. However, after King Lysandus was killed during the War of Betony, Brisienna found herself out of favor with the new regime and was forced into hiding. Nevertheless, she remained the Emperor's emissary in High Rock, assisting another agent sent by the Emperor to investigate Lysandus' death. Lady Magnessen was instrumental in helping this agent recover a powerful artifact, an act which led directly to the event known as the Warp in the West. At some point, Lady Brisienna evidently caught some of the public's imagination, as she was featured as a character in the popular historical fiction Mystery of Talara. This page was last modified on 19 November 2018, at 06:57.